1 photograph: color print: 4" x 6"
Colour print depicts people sitting at a table eating at an unknown event. 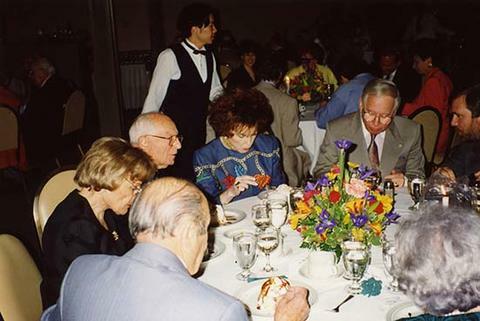 Sitting left to right: Ben Dayson, Phyliss Snider, Irving Snider, Rosalie Segal, Joe Segal, ?. There is a waiter in the background. This image was likely taken at the Richmond Country Club possibly for Dr. Irving Snider's 90th birthday.